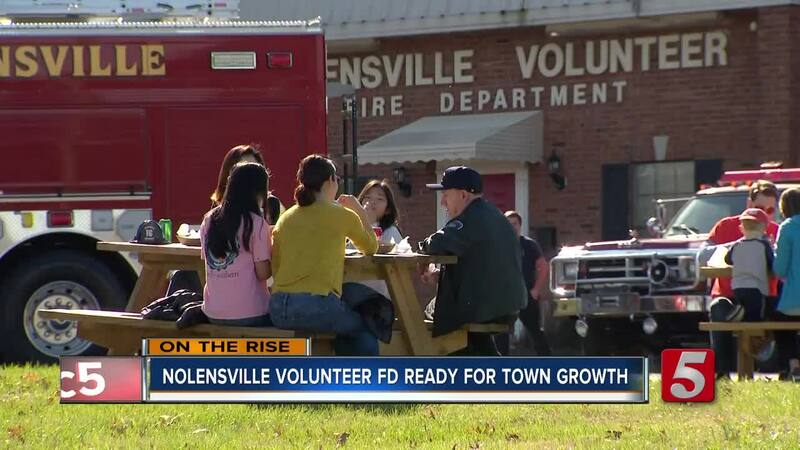 The town of Nolensville has attracted people to move there causing the population to double in the last eight years. Volunteer Fire chief Brian Moat said when the department started in 1973, the department had about 20 charted members. Today, the nearly 50-member team of volunteers respond to hundreds of calls in town and also responded to a 5-mile radius outside of town. "We really have a fairly good size and well populated area," Moat said. Moat, who stepped into leading the department last year, said his team dedicates itself to serving the booming area. "We have a great department and we have just an outstanding membership and a lot of support by the town and its citizens. The biggest challenge is just trying to stay ahead of the growth, making sure that our equipment is staying up with the standards for what we need it for, for the buildings and just meeting the demand and being timely," he said. Alderman-elect Derek Adams said town officials are considering the volunteer fire department follow a combination department-model in the future. "You hire a few, a chief and a couple of firefighters but then they're backed up by the volunteer department. Together they'll provide the fire support that we need and then you can ramp that up over time," Adams said. Despite nearly tripling in population size within the last eight years, town leaders said they are prepared to handle the amount of people moving to the area.